October has been a busy month here at the Excellence offices! I’ve barely had enough time to get my usual four hour afternoon nap! But despite the craziness, fall is my favorite season. There are piles of leaves to attack and mice to catch. Plus, I get to celebrate my two favorite holidays – National Cat Day and Halloween! This month, along with being petted and appreciated, I’ve been planning lots of surprises for all Excellence fans and roster for the last show of the year, 20% Gratuity! We’ve had some of the best wrestlers in the world debut in Excellence this year, like Ricochet and Tessa Blanchard did at Tiramisu. And 20% Gratuity will be no exception! 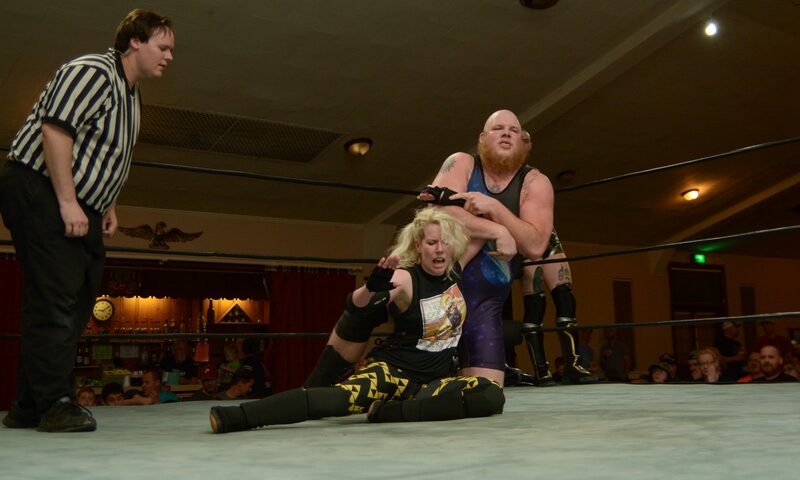 Former friends and partners meet once again as the Nightmare Warrior Hallowicked fights Icarus. Wicked is not just any pumpkin, he’s a great, no, Excellent one. And a victory in this match will give him the 10 wins he needs to enter the Excellence Championship Tournament! He could be the first wrestler to enter, but not if Icarus has anything to say or do about it! At 20% Gratuity, I’m introducing a new match – the Turkey Tumbler Gauntlet Match! (Yummm…Turkey!) Wins towards the Excellence Championship Tournament are at stake in this important contest! All your favorite Excellence wrestlers, like Lady Excellence Deonna Purrazzo, Smiley, and Gran Akuma will be there! I hope you join us for some fall fun! See you on November 14th at our favorite haunt, the Forest Lodge in Sellersville! And when you come, don’t forget to try Too Many Cooks (Assistant Chef Smoothe Blackmon/Sloppy Joe) specials! After Check Please, I revealed the completed Excellence Pro Championship. It’s stunning really, as the artistry is superb, and as a feline, I know style. It’s a belt that when held up says “I’m Excellence.” In case you missed it, here’s another look. The tournament to determine the first Excellence Champion still rages on and anyone can win it! The top contenders are: Hallowicked with 9 wins; Oleg the Usurper, Smiley, Icarus, The Boar of Moldova and Dan Champion have 7 wins each; Akuma has 6 wins; and Blind Rage and Ken Broadway have 5 wins. At Tiramisu, Oleg and the Boar fought to a double count out. Both bruisers approached me afterwards and demanded a rematch, which I granted at Check Please! Boar attacked Oleg with three Gores. He was helped to the back and our medical staff attended to him, but I have not heard hide nor hair nor fur from him since! Love Excellence and need more in your life? We have a Facebook Page and Twitter, so be sure to like and follow us. We also have a YouTube Channel featuring footage from Excellence Live, 5 Minute Matches, and other videos for you to watch. Thanks to our friends at Smart Mark Video, you can watch the latest Excellence releases anytime of the day or night, if you’re a night owl or just a cat like me! Don’t forget to friend me, Edgar Excellence, on Facebook. I promise I won’t bring you bad luck, that’s just a superstition! Also, keep an eye on our website for more missives from me, the Head Cat of Excellence.